Fresh from the experiment box, the “Undo Send” feature is now part of Gmail’s regular options. 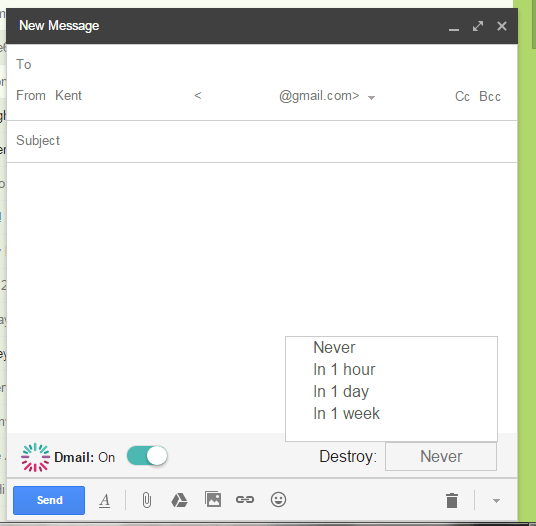 With the said feature, you can easily recall any sent emails within the given set of time. The thing is what if you want to delete your sent email but still give a chance for your recipient to read it? Well, in that case, it’s best to set a time for your sent email to self-destruct. If you want to know how to send self-destructing emails in Gmail, then you better read on. Do note that this is only possible if you’re viewing Gmail in Chrome. First off, you need to download  and install the “Dmail” add-on on your Chrome browser. After installing Dmail, log in to your Gmail account. If you’re already logged in to Gmail, do not forget to reload your Gmail tab. As you can notice on your Gmail dashboard, there’s a new option for “All Dmails” at the top and right beside your Google notifications. If you click on it, it will show you a list of all the self-destructing emails that you’ve sent via Gmail. For now, there’s none but you’re about to make one. To create a self-destructing email, just hit the “Compose” button like usual. Compose your email. Enter the email of your recipient, your email subject, message, etc. You can even include some file attachments. Once you’re done, do not click the “Send” button just yet. Instead, set the Dmail switch at the bottom of your compose box to “ON” and then set your desired self-destruct time. With Dmail, you can self-destruct your email in 1 hour, 1 day, 1 week or Never. So once everything is set, that’s the time that you hit the “Send” button. As soon as your recipient views the email, it will be in its encrypted format. This is to protect anyone from intercepting your email. If your recipient wants to view the email, he or she can simply click the “View Message” button and the actual message will be shown. 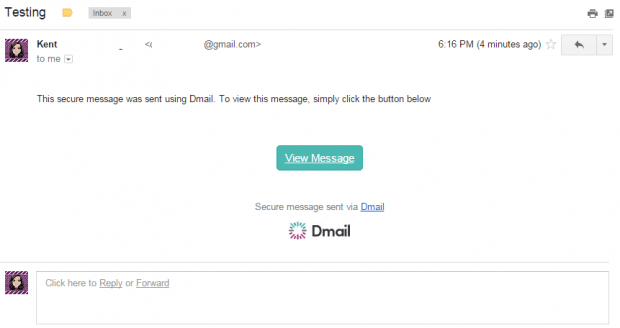 If your recipient also uses Dmail, then he or she can instantly view the encrypted message right within Gmail. Once the self-destruct time is up, Dmail will automatically destroy or delete the email that you’ve sent. Therefore, it will no longer be available on the inbox of your recipient.